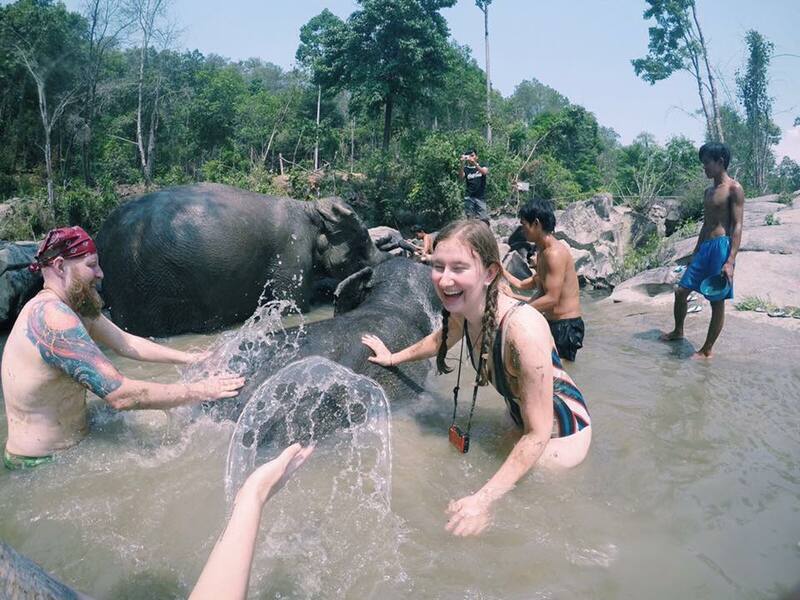 Going to Thailand gave me the opportunity to see elephants in an ethical way. I did some research before my trip and found various sanctuaries. I also asked a friend who'd already been for recommendations. She wanted to ensure her experience was ethical so I felt I could trust her opinion. While there are lots of sanctuaries advertised online I’m not convinced that all of them are ethical. However, we ended up going to a completely different sanctuary. It was the sanctuary our hostel recommended and is partners with. I don’t always trust hostel recommendations but they showed us pictures on Facebook and we went away and did our own research and decided that this sanctuary looked as ethical as the one we were originally going to go to. Into the Wild Elephant sanctuary is one of the newer sanctuaries. It’s not as popular as some of the others which meant there were only five of us on the trip. However, I think it's become more popular since my visit and groups can be up to 15 people. We opted for the half day trip. I think the key difference between the half day and full day was that you got make ‘medicine’ for the elephants if you opted for the full day. The medicine was a ball of food which looked a little like bird food, I’m not completely sure what was in it. If you want more details about what each tour includes then take a look at the Into the Wild website. We were collected from our hostel at around 7am although pick up was between 6.30 and 7 so we were up around 6 just incase. There was already an American couple in the Songthaew. We then went to pick up the last person in our group. We were each given a bandana, I didn’t wear mine as I already had my hat which I carry everywhere to avoid the sun. We were also given a traditional top to wear. I think you are given various forms of this with most of the elephant sanctuaries. Our first stop was 7/11 where we picked up breakfast. I opted for a toastie, cheap and very yummy! I also stocked up on water and some snacks. They collected our lunch which came wrapped in banana leaves and then we set off again. The journey was quite long, probably nearly an hour. It was also very bumpy especially at the end. But it was worth it! When we arrived we had to walk the last bit because the slope was too steep for the truck. As soon as we got down to the bottom of the slope we had our first sighting of the elephants. We were shown to the main area, a wooden building which overlooked the green area and pools and told about each of the elephants. Our guide told us how they had bought the elephants from places such as circuses to ensure they were in an ethical environment. They only had three elephants at the time of my visit because they didn’t have enough money to buy others and still be able to look after the ones they had. I think they now have four elephants, including a four month old baby. I’d never really thought about the fact that sanctuaries might have to pay for elephants. I just assumed if they were rescued they weren’t paid for. But I guess it makes sense, especially if they are coming from circuses or other unethical sanctuaries. After our introduction we went for a walk with the elephants. They were able to wander as they liked. We then gave them a mud bath which involved getting rather muddy ourselves. And finally we went to the normal pool to wash all the mud off. While we did each activity we learnt more about the elephants and how they communicated with them. It was then time for our lunch, vegetable rice and watermelon for desert. Simple but filling. It was also a great opportunity to chat to the other members of the group and our guide who told us more about the sanctuary. He told us how most of the workers were boys from local villages. Younger boys also walked form their villages to visit the sanctuary and go for a swim. Some were there that day. It was really interesting to see how the sanctuary was not only helping the elephants but also supporting the local community. We were told that they'd eventually like to let people volunteer. People like us who had come to the sanctuary and learnt about it and the elephants. He told us he didn't want to charge people to volunteer, instead they would need to contribute to their accommodation and food. I thought this was really good. There are so many volunteer programmes where you have to pay over a £1,000 to volunteer and that's something that's never sat quite right with me. I know accommodation and food is usually included in this cost but when it's a two week programme I really don't see why it's so expensive! I'm really glad I visited the Into the Wild elephant sanctuary, it was not only a really fun day but I finally got to tick seeing elephants off my bucket list and learnt a lot about them. 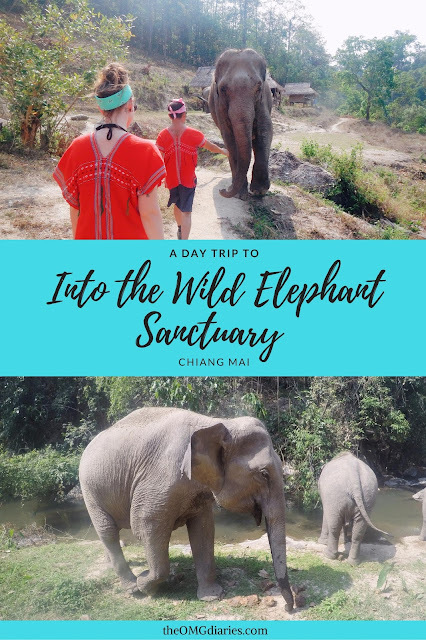 While there are lots of sanctuaries in Chiang Mai to choose from I really do recommend this one as you could really tell the people running it cared about the elephants and educating people about elephants and the cruelty they can face. The half day tour costs 1,700 Thai baht. If you choose to do the full day instead then this will cost you 2,400 Thai Baht. Wear a swim wear you'll be getting wet (and muddy!) and also don't forget your suncream, there's not much shade. While water is provided you may want to bring your own as well, especially for the journey there and back. Have you ever visited an elephant sanctuary? What was your experience like?